With great frequency Bolton was asked to produce graphic ornament for service leaflets and mass cards &c. Here is an example from 1989. 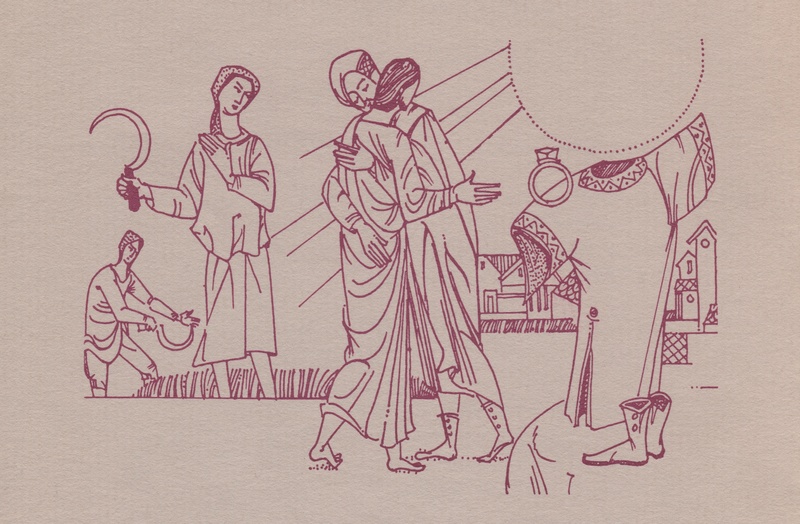 This was a leaflet for a mass commemorating the twenty-fifth anniversary of priestly ordination of a beloved friend and the gospel reading for the day (it being Lent 4) was that of the Prodigal Son. To me this narrative design is very charming and full of what Bolton called “incident”. This entry was posted on July 27, 2015 at 4:11 pm and is filed under Uncategorized. You can follow any responses to this entry through the RSS 2.0 feed. You can leave a response, or trackback from your own site.